After a super mild winter, the snow is steadily falling today in Delaware as I write this Easter post. Seriously, it was in the 70’s a few days ago. This are crazy times, people! Anyway, I just couldn’t wait any longer to share this quilling project idea with you all! In fact, it first came to me a year ago when I was writing this paper Easter egg roundup. And after a year, I’ve gotten my eggs and I’m ready to share how I made my quilling paper Easter eggs today! Like I said earlier, I went with the paper mache Easter eggs, but with the right spray paint, the plastic eggs would work too. A few layers of craft paint quickly changed my eggs from Kraft-paper-brown to fresh-egg-white. Now, the vision that I had in my head this whole time was to transform my eggs into a garden scene. To do this, I needed to paint some grass. I chose 2 leaf green craft paints, one lighter than the other. My plan was to use the darker leaf green first, then one quick layer of the light green, but I wasn’t jazzed with how that looked. After adding a second layer of the darker green, my grass had the dimensionality that I was looking for. Then I really started having fun! Sometimes being a quilling blogger means having tons of leftover bits and pieces of projects past. 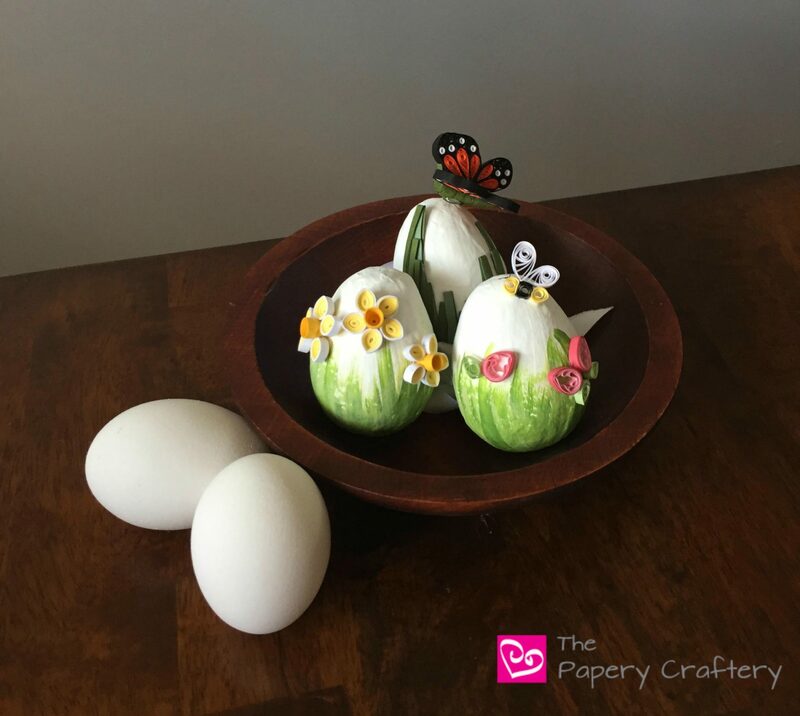 I found the perfect addtions to my garden quilling paper Easter eggs right in my stash! …plus a few quilling paper daffodils! For a little something different, I tried creating a similar effect with just quilling paper. I formed some multi-colored grass on my quilling comb, and worked up a really simple monarch butterfly to rest on top. I’ll add a post on making your own paper grasses and a tutorial on the butterfly soon, but in the meantime, follow the links above to make your own bees and flowers! TIP: Use hot glue to get your 3-D quilling pieces to stick quickly! I first tried with regular old white glue, but I didn’t have the patience! Or just use these ideas as a little inspiration and create your own quilling paper Easter eggs! I’d love to hear what paper elements you’ve added. Leave a comment below and let everyone know about the plan for your eggs! These Easter eggs are so pretty and look so fragile. Never tried quilling before especially such tiny pieces. Would be so pretty to make and display. They’re actually pretty sturdy, Candy! You should give it a try! Thanks Elle! These ready-made eggs were pretty fun to work with. You could add anything to them! These are beautiful! I think quilling is the one of the few things I’ve never tried.. I’ll have to look into this, it looks like it could be fun. It is pretty fun! Give it a try and let me know how it turns out! I’ve never heard of paper quilling before, but find it fascinating! How beautiful. Can you make it with any kind of papers, or do you buy special quilling paper? Thanks Ali! I hope you’ll give it a try. You can buy quilling paper pre-cut online. It’s extremely inexpensive! But, try rolling some thin paper around a toothpick or wooden skewer as practice! This is such an adorable project! I may just have to try it with my little ones! Super cute Easter craft! I hope you do, Lauren! Let me know how they turned out! Beautiful and lovely , really appreciate that !